This linear trail state park is 92 miles long. A 92-mile section is open from Cadillac to Comstock Park. 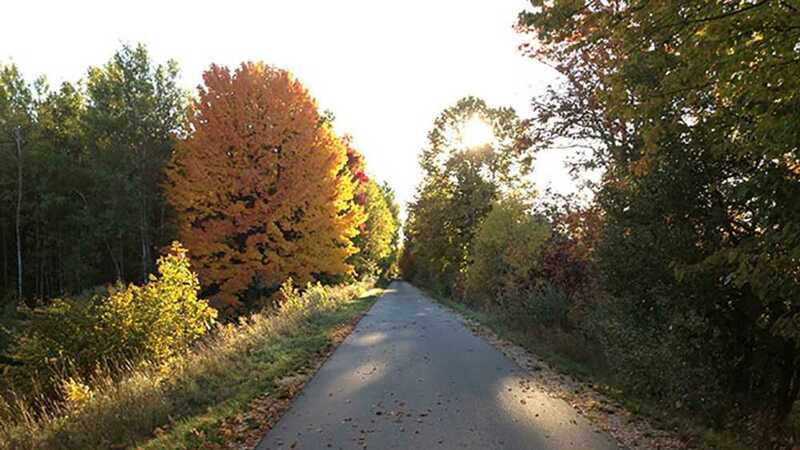 The trail surface is natural ballast and hard packed gravel, with 13 miles of asphalt pavement from Reed City to Big Rapids and seven miles of asphalt pavement from just north of Rockford to Belmont. The DNR currently provides only emergency maintenance services and seeks governmental agencies to operate and maintain its linear park trails. To Cadillac trailhead: Take US-131 north to the M-115 exit and go northwest for a half mile. Take North 41 Road one mile north to North 44 Road. Go west on North 44 Road approximately a half mile. To Big Rapids trailhead: Take US-131 to Big Rapids, exit 139. Take M-20 east to Maple Street. Proceed straight for one-tenth mile to the depot staging area; turn south. To Rogue River Park, Belmont, trailhead: Take US-131 to exit 95 (Post Dr.). Take Post Drive east to Belmont Road. Take Belmont Road a quarter mile south to Rogue River Park entrance; turn left.